Yosemite backcountry trips offer outdoor enthusiasts some amazing scenery, great adventures and a way to get up close and personal with the ecology and environment of Yosemite National Park. Experience the Park the way it was meant to be - from its trails, overlooking waterfalls, and immersed in wildflower meadows. Enjoy 3-4 day treks, fully-outfitted & guided. 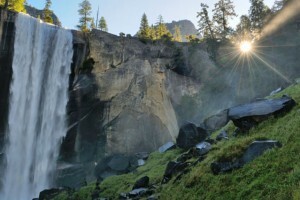 Yosemite backcountry camping is an exciting way to experience Yosemite National Park. The park is divided into distinct regions, each having a variety of trailheads for hiking available. These regions are Yosemite Valley, Glacier Point, Wawona, Tioga Road (from Crane Flat to Tenaya Lake), Tuolumne Meadows and Hetch Hetchy. Check out just a couple of the areas below. On Tioga Road between Crane Flat and Tenaya Lake you will find many trails, each with its own characteristics and scenery. With this area as your starting point, you will find hiking the backcountry and camping out under the stars provides all you’ve been looking for, for a most satisfying trip. One trek starts from the Tenaya Lake Trailhead, a 26.5-mile hike to Yosemite Valley via Snow Creek, with access to the north rim of Yosemite Valley. From White Wolf, you can take a long 32-mile trip to Hetch Hetchy via Rancheria Mountain, with incredible views as you descend into Pate Valley and get further into the heart of the high country. Visitors find Tuolumne Meadows is a real hub for backpacking. Of course, the Tioga Road closes in the winter, so you’ll need to arrive in the summer months to enjoy these hikes. From Cathedral Lake to Yosemite Valley is a 21.2-mile adventure, taking you through forests, past meadows and alpine lakes, and cascading waterfalls. Leave from Rafferty Creek and hike to Vogelsang and beyond. 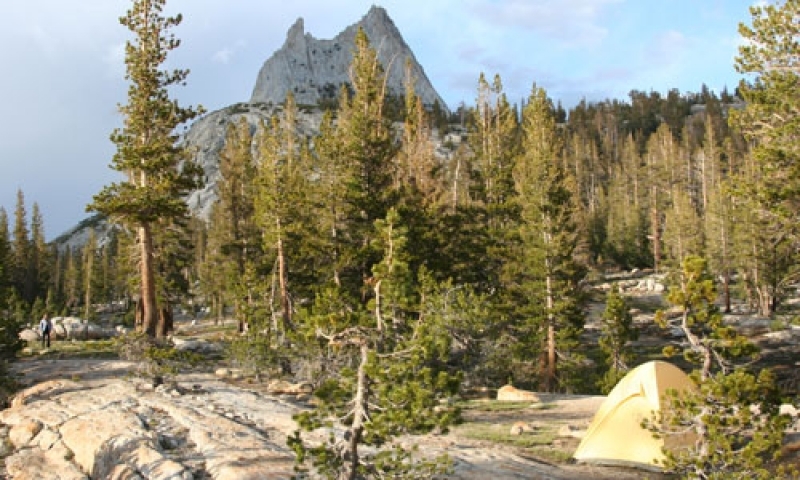 At Vogelsang you’ll find a High Sierra campground that will serve all your needs. Following the Lyell Fork of the Tuolumne River, you can hike 25.4 miles to Isberg Pass, or to Yosemite Valley via Fletcher Creek (28.1 miles). Here you will find some of Yosemite’s most popular and strenuous trails, winding up past waterfalls, huge granite cliffs and with incredible valley views. You can hike to Tuolumne Meadows via Cathedral Lakes or Vogelsang. Both these trails are a bit over 20 miles long. A bit shorter is the hike from Yosemite Falls to Harden Lake or Ten Lakes (17 and 17.6 miles respectively). Or you can brave the John Muir Trail and take the 211-mile trek to Mount Whitney. Plan your trip first, before making your reservations. You will need to know how many people are going, have a mailing address and daytime phone number, know the starting and ending trailheads you will use and your principle destination. You can find trailhead maps on the National Park Service website for Yosemite National Park. You will also see a trailhead availability list to find which trailheads are full for particular dates. Then apply for a wilderness permit. These are available for 24 weeks to 3 days in advance. You can make reservations by fax, letter or telephone. Faxes and letters are given priority and you can print your reservation form from the National Park Service website for Yosemite National Park. The fax number is 209-372-0739. The Mailing address is Wilderness Permits, PO Box 545, Yosemite, CA, 95389, and you make your check or money order out to “Yosemite Conservancy.” Telephone reservations may be made at 209-372-0740, Monday through Friday, 8:30 am to 4:30 pm. After the first night in Yosemite, you can camp anywhere you like within the park, with the exception of near the five High Sierra Camps and in the Little Yosemite Valley. In these areas you must camp at the designated campgrounds. Yosemite Park backcountry is home to hundreds of bears, and these bears are curious, usually hungry and can smell food from a long distance. When humans feed bears, they often become aggressive and have to be killed as a result. Anything with a scent (food, cosmetics, drinks, soaps and toiletries, trash, even ice chests) should be stored away. During daylight, you can keep food, etc. inside your car out of sight and with the windows completely closed. After dark, use a food locker. The locker must be closed and latched at all times. Never leave any food unattended, or in a backpack. When a bear approaches you, you should make a lot of noise to scare it away. Even if it is nighttime, you should yell very loudly or bang pots together. When spotting a bear in the distance, stay at least 50 yards away. When you do see a bear, always let a ranger know. You can call 209-372-0322 and leave a message. Campfires are permitted only between 5 pm and 10 pm from May through September. Put fires out completely with water and don’t let them smolder. Hunting in Yosemite is not permitted. You may not collect butterflies, reptiles, plants or other archeological or historical items like arrowheads. Metal detectors are not permitted in the park. Weapons are not allowed in the park. Bikes are to be kept on paved roads and trails only. Obey posted speed limit signs throughout the park. All human waste must be buried at least six inches deep and at least 100 feet from water sources, camp areas and trails. It should be carried down from the cliffs when rock climbing. Campground information for the area around Mammoth Lakes, California.